I was talking to someone yesterday who I dearly love. God loves us so much that he gives us people in our lives to be lifelong friends. These are the friends who you will be close to forever and through everything. Even after weeks of not talking to one another, you can pick up right where you left off and not feel like strangers. This is the type of friend I met with yesterday. As my friend and I visited, I could tell she has been hurting. Thoughts are overtaking her, and they are clearly not words from God. Although she knows they aren’t the voice of her Daddy God, she is almost tortured with them, and I know so many girls and young women face thoughts like these every day. I’ve heard similar thoughts before, and I know how much energy and life it takes out of a person. What kind of thoughts have you been bombarded with? I’m not pretty enough. Nobody likes me. I’m alone. No one understands what I’m going through. Things would be better if I could just. . . . Maybe you’re overtaken by anxiety or panic attacks. Maybe you have fears that are deeper than what most others have (fear of illness, death, people, speaking). Maybe you even have thoughts of suicide to get out of the situation. It’s something many people deal with — probably more than you could ever imagine. It’s one of the ways the enemy gets in. Don’t underestimate the intelligence of Satan who prowls around like a roaring lion looking for someone to devour (1 Peter 5:8), and he’s looking at us! He knows how to get into our heads and skew our judgement. However, the bible tells us to take every thought captive and make it obedient to Christ (2 Corinthians 10:5). When those thoughts like what I wrote above come into your head, take it captive. Realize that they are not truth, and take hold of them with a firm grip. You are a warrior princess, and you have a sword sharper than anything the enemy can throw at you. God’s word gives you truth for every lie that comes through your head, and with his strength you have the power to take that thought captive and crush it. This is why it’s so incredibly important to get in the word and learn what the truth is. It literally is one of the most important things you can do to hide his word in your heart in order to fight off the devious tactics of the devil. Fill your mind with truth, and in those times where negative or downright rebellious thoughts come into your mind, remember this scripture. If the words in your head don’t fit into this scripture, start praising God in whatever way you enjoy most: speaking, writing, singing, reciting scripture. Fight those lies off with truth. 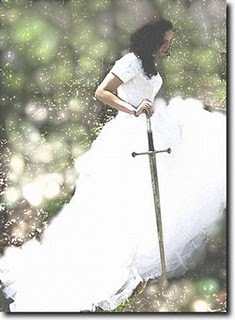 Clothe yourself in the armor of a Warrior Princess for Christ. A final word: Be strong in the Lord and in his mighty power. Put on all of God’s armor so that you will be able to stand firm against all strategies of the devil. For weare not fighting against flesh-and-blood enemies, but against evil rulers and authorities of the unseen world, against mighty powers in this dark world, and against evil spirits in the heavenly places. Therefore, put on every piece of God’s armor so you will be able to resist the enemy in the time of evil. Then after the battle you will still be standing firm. Stand your ground, putting on the BELT OF TRUTH and the BODY OF ARMOR OF GOD’S RIGHTEOUSNESS. For shoes, put on the PEACE THAT COMES FROM THE GOOD NEWS so that you will be fully prepared. In addition to all of these, hold up the SHIELD OF FAITH to stop the fiery arrows of the devil.Put on SALVATION AS YOUR HELMET, and take the SWORD OF THE SPIRIT, which is the word of God. You are a real-life warrior princess, and with God’s help and the right wardrobe, you can fight ANYTHING that comes your way! Needed to read this today… thanks Misty! Crying********** God is using you so much!!! God is good!!!! Thank you. I’m really excited to see where he’s taking me.